Theresa Cara Blair, CBE, QC (née Booth; born 23 September 1954) is a British barrister. She is married to the former prime minister, Tony Blair. Christened Theresa Cara Booth, Cherie Booth was born on 23 September 1954 at Fairfield Hospital, Bury, Lancashire, England, and brought up in Ferndale Road, Waterloo, Lancashire, just north of Liverpool. Her father, British actor Tony Booth, left her mother, actress Gale Howard (née Joyce Smith), when Cherie was 8 years old. Cherie Booth and her younger sister Lyndsey were then brought up by Gale and their paternal grandmother Vera Booth, a devout Roman Catholic of Irish descent. The sisters attended Catholic schools in Crosby, Lancashire. Cherie Booth attended Seafield Convent Grammar, which is now part of Sacred Heart Catholic College, where she achieved 4 Grade-A GCE A Level passes. She read law at the London School of Economics and graduated with First-Class Honours. She later came at the top of her year in the bar exams, while teaching law at the Polytechnic of Central London (University of Westminster). She was the Labour candidate for the Conservative safe seat of North Thanet in Kent in the 1983 general election, losing to Roger Gale. A member of Recorder (a permanent part-time judge) in the County Court and Crown Court. She is a founding member of Matrix Chambers in London from which she continues to practise as a barrister. Matrix was formed in 2000 specialising in human rights law, though members also practise in a range of areas of UK public and private law, the Law of the European Union and European Convention on Human Rights, and public international law. She is Founder and Chair of Omnia Strategy LLP, a law firm. 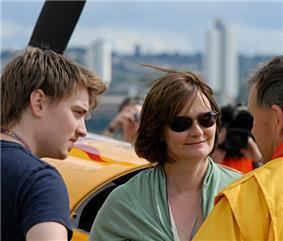 Cherie Blair has appeared in a number of leading cases. A notable example before the European Court of Justice was concerned with discrimination on the grounds of sexual orientation. In November 2007, she expressed interest in becoming a senior judge. In January 2010, when sentencing a defendant, Shamso Miah, for assault, Recorder Booth (Blair) announced that she would suspend his prison sentence after describing him as a "religious man". The court heard that Miah had been to a mosque shortly before he broke a man's jaw following a row in a bank queue. Blair told Miah: "You are a religious man and you know this is not acceptable behaviour." This was interpreted by some observers as special leniency given on account of the criminal's religiosity. The Office for Judicial Complaints released an initial statement saying they had "received a number of complaints in relation to the comments" that Blair had made when sentencing Shamso Miah and that the matter was under investigation. On 10 June 2010, the OJC released a statement saying that the investigation had "found that Recorder Booth's observations did not constitute judicial misconduct" and accordingly "no disciplinary action is necessary". A private letter to the National Secular Society said, however, that the OJC had taken action in the form of "informal advice" from a more senior judge. Blair launched a company called Mee Healthcare with an American business partner Gail Lese in 2011. In June 2015, it ceased trading; all staff were made redundant. She was the 3rd Chancellor of Liverpool John Moores University from 1999–2006. On 26 July 2006, was awarded the honorary title of Emerita Chancellor, as well as the university honorarily naming its new Cherie Booth Building. She is also Governor of the London School of Economics and the Open University. On 2 March 2011, Cherie Blair was appointed the Chancellor of the Asian University for Women. In July 1999, Blair was awarded the honorary degree of Doctor of the University (DUniv) from the Open University. In 2002, Blair purchased two flats in Bristol with the assistance, it was alleged but later denied, of Peter Foster, a convicted Australian conman and boyfriend of Blair's friend Carole Caplin, who negotiated a discount for Blair. Blair publicly apologised for her embarrassing connection to Foster, stating "I did not think it was my business to choose my friends' friends". Her relationship with Caplin gave rise to headlines in some newspapers, as Caplin is credited with introducing Blair to various New Age symbols and beliefs. Reports of Blair's New Age practices included an account of her 2001 holiday in Mexico, when she and her husband, wearing only swimming costumes, privately took part in a rebirthing procedure that involved smearing mud and fruit over each other's bodies while sitting in a steam bath. In 2002, she apologised after saying within hours of a Jerusalem blast that killed at least 19 people in reference to the Palestinian suicide bombers: "As long as young people feel they have no hope but to blow themselves up, we're never going to make progress, are we?" 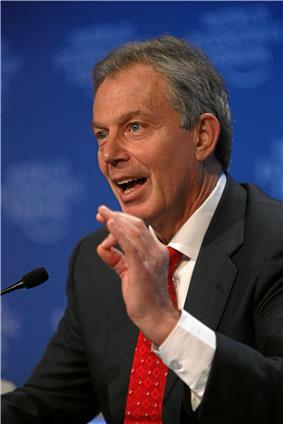 On 12 December 2008 Blair gave a lecture alternatively entitled "The Church and Women's Rights: time for a fresh perspective?" or "Religion as a Force in protecting Women's Human Rights" at the Pontifical University of Saint Thomas Aquinas, Angelicum, in Rome. Blair, Cherie (2008). Speaking for Myself: The Autobiography. ^ Blair, Cherie (2008). p 9. 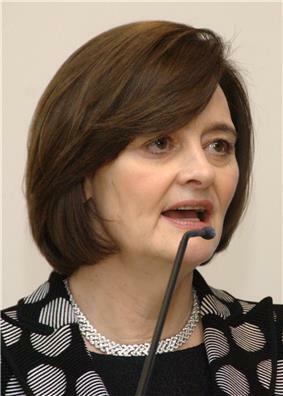 ^ "Profile: Cherie Blair". BBC News. 19 June 2002. Retrieved 19 October 2013. ^ Walker, Tim (13 September 2009). "Cherie Blair plans to be Gordon Brown's secret weapon at the election". Daily Telegraph (London: Telegraph Media Group). Retrieved 1 April 2013. ^ "Omnia Team » Cherie Blair CBE, QC". omniastrategy.com. Retrieved 1 September 2015. ^ "Purja & Ors, R (on the application of) v Ministry of Defence  EWHC 445 (Admin) (21 February 2003)". Bailii.org. Retrieved 19 October 2013. ^ "CURIA – Search form". Curia.europa.eu. Retrieved 19 October 2013. ^ Doughty, Steve (14 November 2007). "Me a top judge? Maybe, says Cherie". ^ "Complaint after Cherie Booth spares religious man jail". BBC News. 4 February 2010. Retrieved 19 October 2013. ^ Taylor, Jerome (4 February 2010). "Secular society upset by Judge Cherie decision – Home News – UK". The Independent (London). Retrieved 19 October 2013. ^ "Statement from the office of judicial complaints" (PDF). OJC. 10 February 2010. Retrieved 12 February 2010. ^ "Investigation Statement – Recorder Cherie Booth QC" (PDF). Office for Judicial Complaints. 10 June 2010. Retrieved 19 October 2013. ^ "Cover-up claim over Cherie Blair court remark to Muslim". BBC News. 19 June 2010. Retrieved 19 October 2013. ^ "Cherie Blair's healthcare company goes bust and staff laid off". Metro. 20 June 2015. Retrieved 17 July 2015. ^ "Cherie Blair Named Chancellor of Asian University for Women". PR Newswire. UBM plc. 2 March 2011. Retrieved 1 April 2013. ^ Cohen, Nick (10 December 2002). "Nick Cohen: Ev'rybody must get stones". The Observer (London). Retrieved 19 October 2013. ^ Glover, Julian (9 February 2005). "Cherie under attack: from fur in flight to freebies". The Guardian (London). Retrieved 19 October 2013. ^ "PM's wife 'sorry' in suicide bomb row". BBC News. 18 June 2002. Retrieved 19 October 2013. ^ a b Crawley, William (6 December 2008). "Pro-life campaigners urge Catholic university to ban Cherie Blair". Will & Testament (Crawley's blog). BBC. Retrieved 1 September 2015. 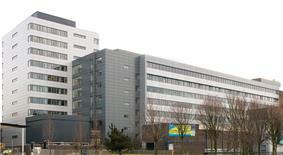 ^ "Cherie Blair opens extension at Jospice in Thornton". YouTube. 1 June 2009. Retrieved 19 October 2013. ^ "Our Patrons". Scope. Retrieved 27 June 2014. ^ "Cherie Blair". Cherie Blair. Retrieved 11 January 2012. ^ "Child in Need India". CINI. Retrieved 11 January 2012. ^ "Cherie Blair Foundation for Women". Cherieblairfoundation.org. Retrieved 19 October 2013. ^ The London Gazette: (Supplement) no. 60367. p. 7. 29 December 2012. ^ Roberts, Dan; Gibson, Owen (1 July 2015). "Hillary Clinton lobbied by Cherie Blair to meet Qatari royal, emails reveal". theguardian.com. Retrieved 1 September 2015. ^ Blair, Cherie (3 July 2015). "I did not lobby on behalf of Qatari royal". theguardian.com. Retrieved 1 September 2015. ^ Harding, Luke (1 September 2015). "Hillary Clinton emails: Cherie Blair lobbied for Qatari crown prince". theguardian.com. Retrieved 1 September 2015. ^ Sherwell, Philip (9 September 2015). "Amal Clooney v Cherie Blair: Maldives paradise islands stage battle of UK female lawyers". telegraph.co.uk. Retrieved 21 September 2015. ^ "Conduct of trial of Maldives' ex-President raises serious concerns". ohchr.org. United Nations. Retrieved 21 September 2015. ^ "Facts: Life and times of Tony Blair". Edition.cnn.com. Retrieved 19 October 2013. ^ "'"Blair's son 'drunk and incapable. BBC News. 6 July 2000. ^ "Cherie Blair suffers miscarriage". BBC News. 6 August 2002. Retrieved 19 October 2013. ^ Mcdonagh, Melanie (13 September 2009). "Names that mean trouble". Sunday Times (London). Archived from the original on 28 July 2011. ^ Kettle, Martin (17 May 2008). "Martin Kettle interviews Cherie Blair". The Guardian (London). Retrieved 19 October 2013. ^ Conlan, Tara (26 March 2008). "Cherie Booth tackles street crime with Channel 4". The Guardian (London). Retrieved 19 October 2013. ^ "Faith". The Times (London). Retrieved 19 October 2013. ^ "Blair: end Church's hard line on birth control". Herald Scotland. 31 August 2009. ^ Bush, George W. (2010). Decision Points. New York, NY: Crown Publishers. p. 231. ^ "The PM, his glamorous aide and a jealous wife... but it's just a novel". Daily Mail (London). 18 September 2007. Retrieved 19 October 2013. Robert Harris's fictional thriller, The Ghost, features a pivotal character, Ruth Lang, inspired by Blair, who is revealed to be under the influence of the CIA. She is portrayed by Olivia Williams in the 2010 film adaptation by Roman Polanski. Played by Helen McCrory, Blair features as a character in The Queen (2006), starring Helen Mirren, about the aftermath of the death of Diana, Princess of Wales in 1997, and is portrayed as a fierce anti-monarchist. McCrory played her again in the 2010 HBO film The Special Relationship. Cherie Blair also features as a character in Chris Bush and Ian McCluskey's production TONY! The Blair Musical. Phoebe Nicholls played her in The Trial of Tony Blair (2007). She was also a subject in Shoot The Dog, a song by George Michael that was critical of the Iraq war. Blair wrote a book of her memoirs, published in late May 2008, entitled Speaking for Myself: The Autobiography, and the book was listed as a Sunday Times best-seller. Interviewed about the book by Carole MacNeil on the Canadian network CBC Television on 1 June 2008, Blair stated that she felt most of the controversy about her in the British media was due to her pioneering role as the first wife of a British Prime Minister who had her own career, with the media simply not knowing how to treat her fairly and objectively. She is a practising Roman Catholic. In 2009, Blair urged the Catholic Church to reconsider its hardline stance against contraception, suggesting it could be holding some women back from pursuing a career. Blair has described herself as a socialist and, at times, has appeared to have views further to the left-wing politics than those of her husband. In March 2008 she chaired the Street Weapons Commission on behalf of the broadcaster Channel 4. She toured the UK and took evidence from people affected by street crime and published a report and practical advice in June 2008. Via her father, Blair and her younger sister Lyndsey have six half-sisters, including British journalist Lauren Booth. Leo, born 2000, was the first child born to a serving British Prime Minister in over 150 years, since Francis Russell was born to Lord John Russell on 11 July 1849. Another pregnancy at the age of 47 ended in miscarriage in early August 2002. The Blair children are noted for having attended highly selective Catholic secondary schools that were selecting their pupils by way of exams, interviews and aptitude tests during Blair's time in office. All four children have Irish passports, by virtue of Tony Blair's mother, Hazel Elizabeth Rosaleen Corscaden. In 1976, while she was studying to become a barrister, she met future Prime Minister and husband Tony Blair. She obtained a pupillage in the chambers of Derry Irvine ahead of him, although he was also taken on. Married on 29 March 1980, the Blairs have three sons and one daughter: Euan, Nicholas, Leo and Kathryn. In summer 2015, Blair's law firm accepted a large fee to advise the autocratic Maldives government as it faced a challenge from former Maldivian president Mohamed Nasheed over his imprisonment for "terrorism". Nasheed, who served during 2008–12 as his country's first democratically elected leader, is seeing out a 13-year term after a widely criticised trial. In summer 2015, in the wake of the Hillary Clinton email controversy, Blair was revealed by The Guardian to have lobbied Clinton in 2009 on behalf of prominent members of the Qatari monarchy; Clinton was US Secretary of State at the time. In a letter to the newspaper, Blair denied this characterisation of her mediation efforts, describing their story as "sensationalist and inaccurate". Precisely two months later, the release of another batch of Clinton's private emails confirmed that Blair had, indeed, arranged meetings with Clinton for the Qataris outside normal diplomatic channels, with discussions to involve "the US/Qatar relationship generally", not merely joint philanthropic efforts. In one case, Blair herself stated that her purpose was to help the eldest of Sheikha Mosah's sons, Jasim bin Hamad bin Khalifa Al Thani, "build up an international profile". She was appointed Commander of the Order of the British Empire (CBE) in the 2013 New Year Honours for services to women's issues and charity. In 2008 she launched her foundation the Cherie Blair Foundation for Women, a development organisation that aims to support women entrepreneurs in developing countries. "Our mission is to provide women with the skills, technology, networks and access to capital that they need to become successful small and growing business owners, so that they can contribute to their economies and have a stronger voice in their societies," says its mission statement.